$2,800; completion of this program offers participants a 200-Hour Registered Yoga Teacher certification. A $500 deposit is required in order to register and ensure a spot. SoulShine Yoga is a registered Yoga Alliance School. Payment plans available at $200 additional cost. Tuition includes all dates referenced below and a 35-Class Pack. Memberships are put on hold for 3 months while you use your Class Pack. will lead the majority of this training program with focus on Alignment, Energy, Philosophy, Teaching Methodology, Sequencing and the Art of Assisting. will lead Ayurvedic Studies, Philosophy, Meditation and Pranayama. 6 other master teachers will be guest speakers at the below workshops. our training goes much deeper than the poses. and even a little astrology, sound healing and Reiki. You will develop a "family"/connectedness with the other trainees and your leads. Can I miss any lectures? Yes. You can have a fellow trainee voice record the lecture for you. You will be expected to do a write-up on the topic. It isn’t advisable to miss more than 14 hours. Why would I choose SoulShine’s TT over another studio’s? Most trainees choose it because they like the environment and feel of our studio. It’s a well-balanced program that is more comprehensive or in-depth and certainly more nurturing than bigger or corporate yoga studios’ trainings. You are given a sequence that you will be ready to teach when finished, and you are also taught how to sequence, which is essential. The ayurveda information is straight from the Chopra Center - a program that costs several thousand dollars alone. Our trainees really bond and create a “friends family”. Will we be practicing yoga every time we are together? No. There is a lot of lecture in this training. Some weekends, we will be practicing a lot, others we’ll be sitting more, and most will be a mix of both. We sit on the floor, fyi. What should I wear / bring? Wear yoga clothes and bring your binder, writing utensil, mat, water and a snack. There will be breaks. Vinyasa Yoga Technique - vinyasa is linking the poses together to the tempo of the breath. We will break down EVERY pose in our sequence. Anatomy and Physiology - you’ll learn about the physical body, the movements of the spine, about muscles and bones, and more. Teaching Methodology - how to teach, what to teach, what’s in a well-rounded sequence, intention, assisting, etc. Yoga Philosophy - there are 8 limbs to yoga; we will talk about each of them and read a related book. Breath Work (Pranayama) - we’ll explore more than just the ujjayi and why breath work is essential and beneficial. Ayurveda - ayurveda is rather in depth. Our lectures will dive into what your mind and body types are and how to keep them in balance. We’ll cover topics like routines, diet, healthy emotional expression, and communication. Yoga Basics - even if you have a really solid practice already, it’s good to go back to the basics. A lot of people do chaturangas wrong. Learn the foundations and protect your joints. Chakras - chakras are energy centers. We are putting energy out and taking energy in at all times. We will break down 7 in an in-depth way and do an experiential meditation. Meditation Weekend - meditation techniques will be explored for a whole weekend, possibly even field tripping for part of a day so we can meditate outside. Astrology - this workshop will help you to identify your innate strengths, put words to your persona, and help you to understand your emotional side. It will also explore your life purpose, where your soul needs to evolve. Restorative Yoga: we’ll spend a few hours discussing and experiencing passive poses that use supportive props. Sound Healing Experience - we are very sensitive to sound due to its vibrations. If you were to see a crystal bowl with water in it being played, you would see the harmony created in the patterns of the water. Our bodies are approximately 70% water, so the sounds create harmony within us physically, but on other levels too. Inversions - arm balances and upside down poses will be explored. Reiki Introduction - Reiki is a healing practice. Learn about it and how it can be used in your teaching or just on yourself. “This experience changed me and provided valuable tools to create and maintain positive practices in my everyday life.” ~Nichole B. “SSY training embodies everything I appreciate in a great teacher - creative asanas, inspirational attitudes and a passion for the spirit of yoga." ~Marissa C.
“I loved it all! The Astrology workshop, meditation weekend and Reiki workshop were my top 3 favorite experiences on top of the yoga. This training has taught me to live a more meaningful and purposeful life, to follow my passions and stay true to my heart. Life changing!” Makayla M.
"The atmosphere at SoulShine allowed for each of us to bare our souls and become really connected to each other. This also helped us identify why we were there and what we wanted to come away with from this journey." ~Angie C.
"I highly recommend this program!" ~Toni F.
"SSY is an incredibly loving and supportive community! Not only is it a safe space to practice yoga, but also to heal, transform and grow. As far as TT goes, I always felt so comfortable exploring new areas of knowledge to add to my practice and to life in general. It was a wonderful environment to explore new concepts and share ideas with like-minded souls. ~ Jen B. "I couldn't imagine a better place to do your training." ~Brittany G.
"I really enjoyed my teacher training experience at Soulshine Yoga. The program encompassed all of the facets of a well-rounded program. I recommend it to anyone who is committed and passionate in becoming a yoga teacher. ~Adrienne W.
"SoulShine Yoga Teacher Training is a wonderful program. I'd recommend this experience to anyone with a passion behind enhancing their personal practice and learning to enhance others". 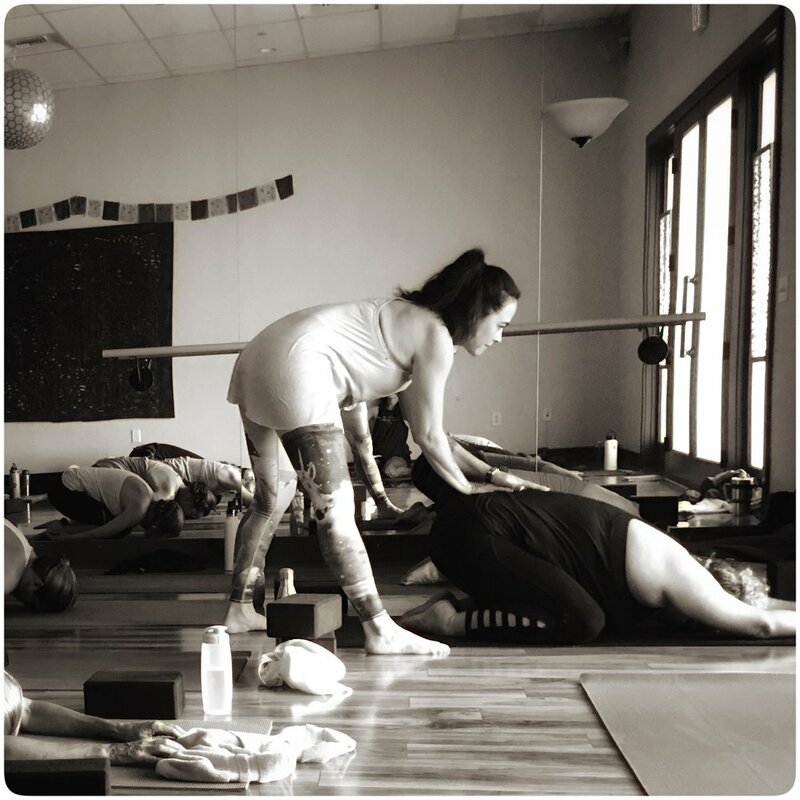 ~Kayla S.
"When I signed up for teacher training at SoulShine, I had a feeling it was going to be great based on the studio's high quality and vibe. I wanted a teacher training that would be holistic, incorporate many perspectives and ideas, and teach me the foundation for being a solid yoga teacher--- and this is exactly what I got! The teachers were incredible. Their passion for yoga, humility, grace and BEING the teachings was evident each and every session. Furthermore, I loved all the workshops! What a wonderful experience to have all those extras. The one "theme" of the training that stands out to me is the support and POSITIVITY we all exchanged. And the sequence is SO good! I love it - it includes all the basics and has a lot of flavor to it, what a head start we have!" Courtney S.
"There are almost no words to describe how powerful Yoga Teacher Training at SoulShine was. It was a truly a life changing experience. The smaller, intimate setting enabled so much opportunity for a deeper connection between students and instructors. There was a perfect balance between the spiritual aspect of yoga and the more technical side, including proper alignment of poses and the art of sequencing. All of this in addition to receiving a certification!" ~Nichole B.